Ever played a concert or been practicing and felt like your were fighting to keep your guitar in place? It’s the worst with slacks: the guitar slides everywhere. Enter the leg sticky. A leg sticky is a small patch of shelf liner or a cut up swim cap. Anything that has a lot of friction will do fine. I use shelf liner. Simply cut a chunk of of whatever material you chose, put it on your left leg, and set the guitar on top of it. This should keep the guitar from sliding. When you play in slacks, it’s also a good idea to put another bit of material on your right leg where the guitar contacts it. This will keep the guitar’s neck from getting pulled back. To be honest, setting the material on the right leg will probably do a better job of keeping the guitar in place. Great topic. There’s a video floating around the ‘net of an Aniello Desiderio masterclass illustrating this very problem. A couple of the students are seen performing a particular piece and, during a break between phrases, can actually be seen pushing the lower part of the guitar back in towards their body. Some of the pieces are pretty advanced stuff, making me believe these are advanced performers that have been around the guitar a while. If it’s a problem for them, it can only exacerbate a beginner’s confusion. It sticks to the guitar without damaging the finish, and if it starts to loose stickiness one simply washes it with some warm soapy water, pat dry and it goes back to its’ original sticky quality. I can assure you, your guitar will NOT slip with one of these. Find them at any major store that caries auto supplies or accessories. You guys are awesome. I didn’t know about either of those things. draft excluder also works quite well. I had some leftover from soundproofing, a few well placed strips gives the guitar the required grip. 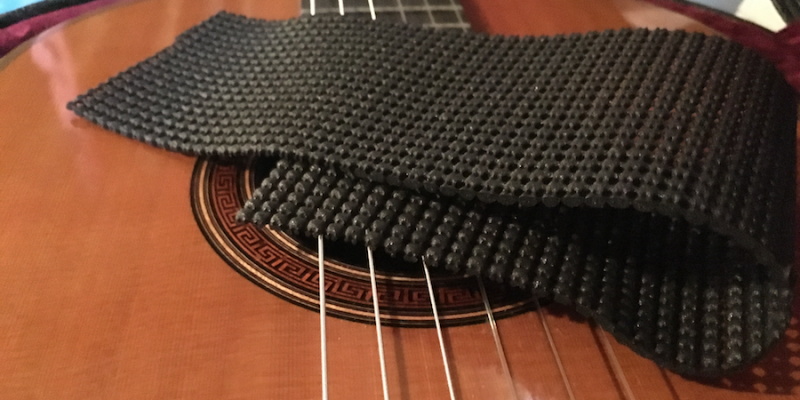 I learned about using a piece of rubberized kitchen shelf mat several years ago watching young guitarists in the Paracho, MX concursos. I have used it ever since, and it works very well for me.